The Outdoor Mega Combi Standard CODMC7 is a condensing, floor-standing, oil Combi boiler that has been designed and manufactured by Mistral. This highly reliable boiler is a highly efficient, full heating and instant domestic hot water boiler, available with an efficiency rating of 90%, making it A rated. An output rating of 68kW and a flow rate of 17 - 35 XXL, make this unit the perfect choice for larger homes with a high demand for heating and hot water. 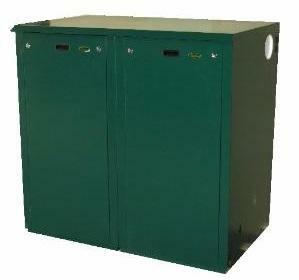 A fully-insulated, weather resistant casing, gives the boiler optimum protection from corrosion and the green polyester coating blends the boiler in with its outdoor surroundings. This green casing is available in 2 parts for easy handling. Some of the many features of the Mistral Mega Combi Standard, include a frost stat for year-round protection, multi-directional flue, pre-punched pipe entry points positioned on both the back and sides, lockable cabinet door, tandem operation and can be serviced without the need for the engineer to access the residential area of the property. Backed by the Mistral guarantee of high-quality, this boiler comes with a 2 year warranty on parts as well as a 5 year warranty on the heat exchanger, so you know that this boiler won’t be letting you down.